What It’s About: David Dunn (Bruce Willis) is the sole survivor of a horrific train wreck. He begins to sort out what it all means when mysterious comics book super fan Elijah Price (Samuel L. Jackson) contacts him with a theory: what if Dunn is a real life superhero, an invulnerable man…and what if he has other powers? Why Watch it Today? : Star Bruce Willis turns 59 today. Willis is excellent in this low-key not quite superhero mystery thriller from the days before M. Night Shyamalan’s career went off the rails. Other Choices: See Willis in one of the greatest action films of all time, Die Hard; as a boxer on the run in Pulp Fiction; or as a tired cop having an affair in Moonrise Kingdom. This entry was posted in Drama, Movie of the Day, Mystery, Superheroes, Thriller and tagged Bruce Willis, car accident, comic book store, estranged spouse, home invasion, husband, insanity, M. Night Shyamalan, Philadelphia, Robin Wright, security guard, stadium, train, train wreck, twist, weight lifting, wife. Shame that this one doesn’t get as much notice or recognition as Sixth Sense does, but still a fine movie all the same. Nice pick! 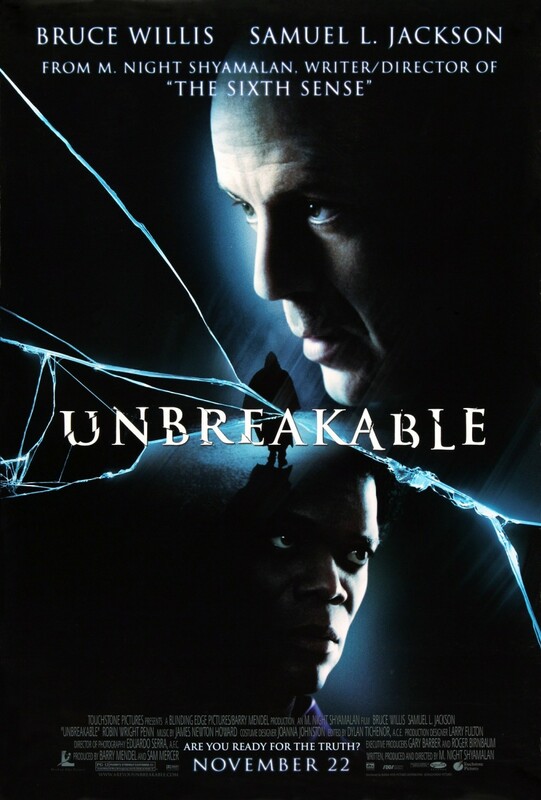 I’ve never understood why this film was the start of the backlash against M. Night Shyamalan, when it’s actually a decent thriller and a fun superhero story that doesn’t resort to the usual punch ups.